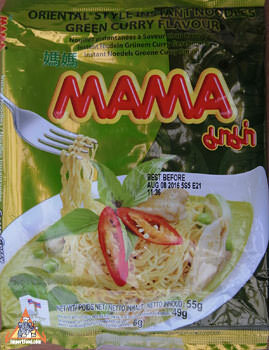 Mama's brand new instant noodle is green curry flavor, which is very good. It comes with a dry spice packet and a packet of green curry paste. You put both packets in a bowl with the noodles, add 1 cup of boiling water, cover for three minutes and serve. We added some cooked shrimp and fresh Thai eggplant, quartered. This meal has mild spice and delicious. Ingredients: wheat flour, palm oil, sugar, salt, msg, garlic powder, basil leaf, bergamot leaf, chilli powder. Product of Thailand.